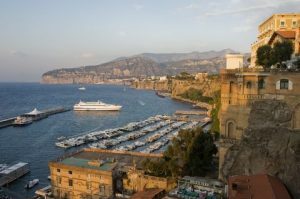 Sorrento is a small town wonderfully located over white steep cliffs and offers a fantastic view over the Bay of Naples. It lies on a Tufa terrace along the Coast of the beautiful Sorrentine Peninsula and is enclosed by impressive rocks of the limestone mountains. For 2000 years already visitors from all over the world have been attracted to Sorrento by breathtaking sunsets and fragrances of orange and lemon gardens. Its main attractions, beside its wonderful location, are the little historic centre with many boutiques and souvenirs shops, the panoramic Park Villa Comunale and the picturesque fisher port Marina Grande.